This pages focuses on benefits of milk thistle - What is milk thistle? What are the health benefits of milk thistle? Are there any milk thistle side effects? Read on and find out. Milk thistle (Silybum marianum) belongs to the daisy family. It is native to the warm and dry areas of southern Europe and northern Africa. It has shiny, spiny, mottled leaves, and the flowers are fuzzy, soft, and red-purplish. The small, hard-skinned fruit is brown, spotted, and shiny. 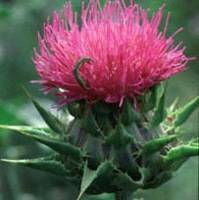 Milk thistle gets its name from the milky white fluid that comes from the leaves when they are crushed. Milk thistle has long been used in Europe as a "liver herb". German researchers have identified a group of active ingredients found mainly in the seeds of milk thistle. These ingredients are collectively called silymarin. It strengthens the outer membranes of liver cells, thus preventing toxins from penetrating the liver. It stimulates the liver's ability to form new cells and repair itself. In addition, silymarin has been found to be able to prevent or alleviate gallstones. Our liver carries out numerous essential functions, such as detoxifying harmful substances in the body, purifying the blood and manufacturing vital nutrients. It is not difficult to imagine that any damage to our liver can result in potential serious health problems. As mentioned above, milk thistle is the herb for the liver. It prevents damage to the liver and helps repair a damaged liver. It can also help a healthy liver remove toxins more effectively. Cirrhosis: Cirrhosis is caused by scar tissue that forms in the liver in response to damage that occurs repeatedly over many years. Scarring can be caused by various reasons such as long-term alcohol abuse or hepatitis. With scarring, the liver cannot effectively carry out its many important functions, such as storing and filtering blood or producing bile. Researchers in Austria have found that milk thistle helped patients with cirrhosis of the liver caused by alcohol abuse. It has been found that the patients who took milk thistle extract lived significantly longer, with no negative side effects. Hepatitis: Hepatitis is an inflammation of the liver and there are several types of hepatitis. Although most types are caused by viral infection, there are other causes as well, such as drug overdose (including acetaminophen (Tylenol), which can cause liver damage in high doses), exposure to certain chemicals, or alcohol abuse. Milk thistle has been found to be able to protect and regenerate injured liver cells and is effective in treating hepatitis. Environmental Toxins: Environmental toxins can cause a lot of damage to the liver which is the main toxin-removal organ. Milk thistle, in the same way that it protects the liver from alcoholic intoxication, can help prevent damage caused by environmental toxins by strengthening the liver cell membranes to prevent toxic substances from entering the liver. Mushroom Poisoning: Death cap mushroom, Amanita phalloides, contains toxins that kill liver cells. European researchers have found that one of the compounds in silymarin can be used to treat severe death cap mushroom poisoning. If given within 24 hours of ingestion, it significantly reduces the risk of liver damage and death. Most milk thistle products are standardized preparations made from the seeds of the plant. Most preparations are standardized to contain 70 to 80% of silymarin. The recommended average daily dose is 200 to 400 milligrams of silymarin per day. However, if you think you have a liver problem, you should first consult a doctor since liver disease can be serious and even life-threatening. Also consult a holistic practitioner if you want to use milk thistle to treat your existing liver problems. Milk thistle side effects are usually mild and may involve stomach upset and diarrhea. Milk thistle should not be used by pregnant or breastfeeding women. Consult a doctor first before giving milk thistle to a child. People with a history of hormone-related cancers, including breast and uterine cancer and prostate cancer, should not take milk thistle. Duke, J.A., Dr. Duke's Essential Herbs, (Rodale Books, 2000).